Where exactly is the south west of Tenerife? The island is such a shape that it can be difficult to define exactly which points of the compass some areas fall under. For example, Costa Adeje is often described as being in the south west of Tenerife and technically, I guess, it is as it’s west of the most southerly point near the Rasca lighthouse. But it’s nowhere near the most westerly point at Punta de Teno. Plus, Playa de las Américas is usually described as being in the south of Tenerife, and yet it is joined at the hip to the Costa Adeje resorts. It’s a conundrum. 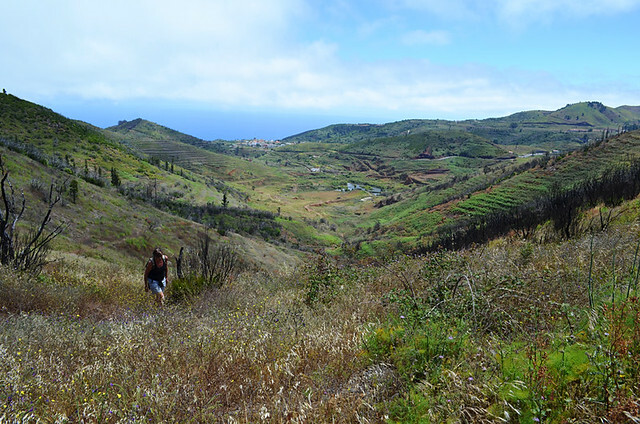 When it comes to walking we think of the south west as roughly covering an area on the south side of the Teno Massif down to around the Playa San Juan area on the coast and above Guia de Isora in the hills. 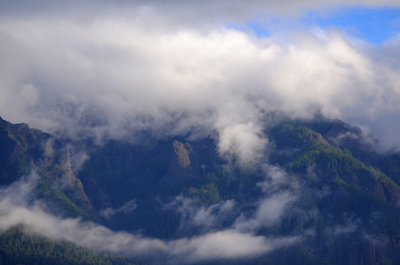 There are a couple of reasons we make this distinction; one is there is a noticeable difference in weather patterns. The further south west you travel, the more sunshine you get. The other is there’s a difference in personality and terrain. The further west you travel, the more banana plantations creep into the frame. 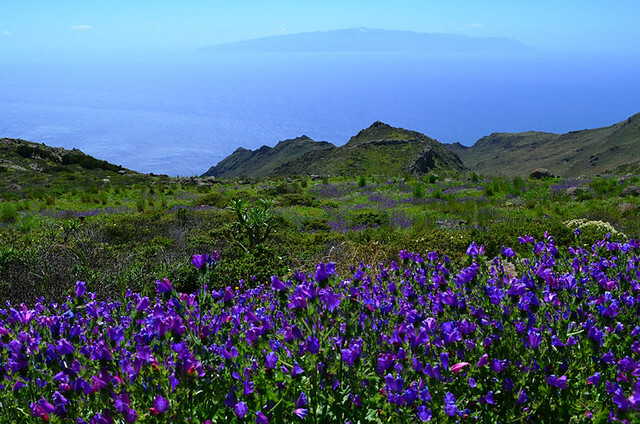 Coastal towns there were linked to La Gomera, with ships bringing in produce from Tenerife’s neighbour. Subsequently towns like Alcalá and Playa San Juan have more of a traditional Canarian feel. All in all, there’s a wonderful diversity of walking in the west and south west, including a route which would probably be in our top three walking trails on Tenerife. 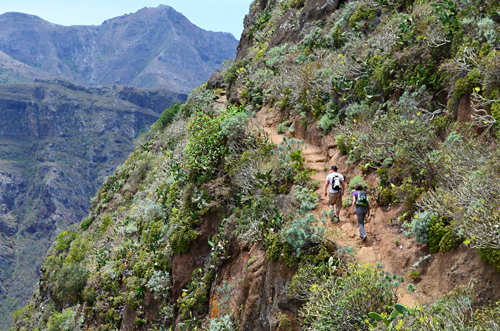 If it wasn’t for the fact that there are too many walkers in the Masca Barranco, it would be right up there with the best walking routes on Tenerife. As we are guilty of promoting walking that might sound hypocritical, but we’re huge fans of responsible tourism; something we believe applies to self-guided walking and small walking groups. However, a significant number of the groups which tackle Masca are simply too big and subsequently change the dynamics of walking there as well as contribute to safety issues. But that doesn’t stop it being a special place and Masca is a Tenerife highlight worth seeing whether you tackle the ravine or not. 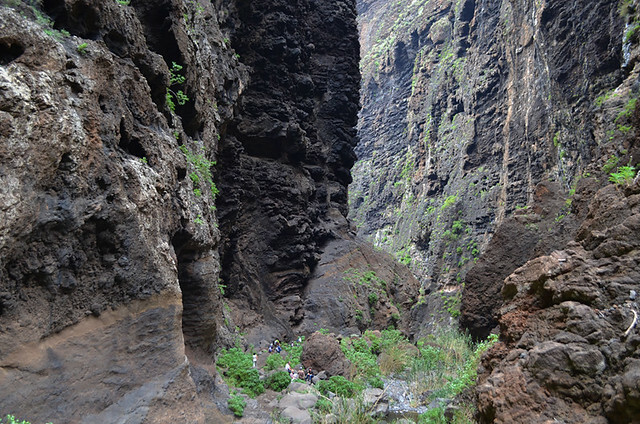 The uneven terrain makes it more adventurous than most other Tenerife walks. 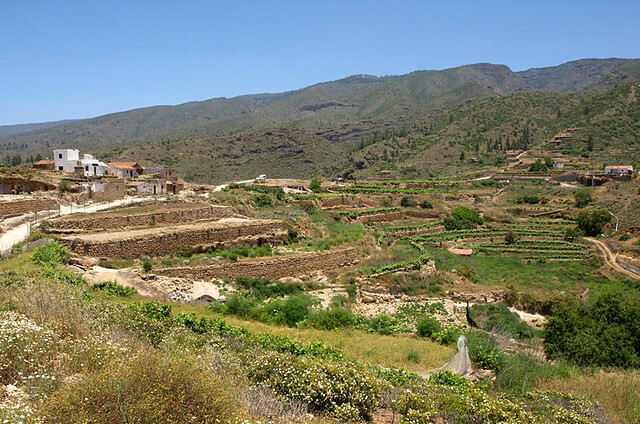 When tourism boomed on Tenerife, many of the younger campesinos gave up the hard toil in the hills and took up jobs in resorts instead, leaving some agricultural hamlets to become virtually abandoned. It’s a sad erosion of traditional life, but it does mean there are curious remnants of a past life to be discovered in the hills above the south west coast. Whenever we had visitors who enjoyed a stroll in the countryside, but not too long a stroll, we’d take them on a shortish route around the Erjos Pools. Before forest fires in 2007 and again in 2012, the landscape around the pools was just stunning. Despite losing the trees which added to the beauty of the area, it’s still one of the most scenic parts of the island and, as it borders the north south divide, is easy to get to from the south west resorts. 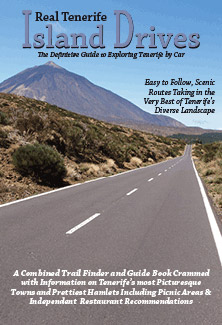 Not long after we moved to Tenerife we had a commission to write about Santiago del Teide. It was late April and some fields around the valley were awash with colour as wild flowers exploded into life. It was the first time we realised that Tenerife did actually have distinctive seasons. 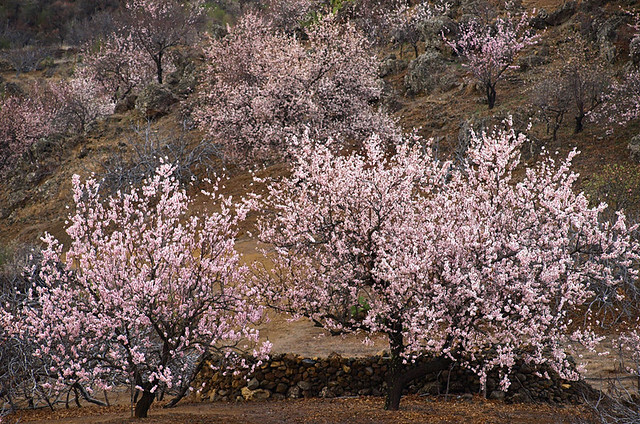 When I visualise the Valle de Santiago, plants are often involved – wild flowers in spring, scarlet tabaiba on a route up to a little cave shrine and, most famous of all, the sea of pink almond blossom in January/February. Although the south west coast doesn’t have the best coastal walks on the island, some are still enjoyable with interesting aspects. 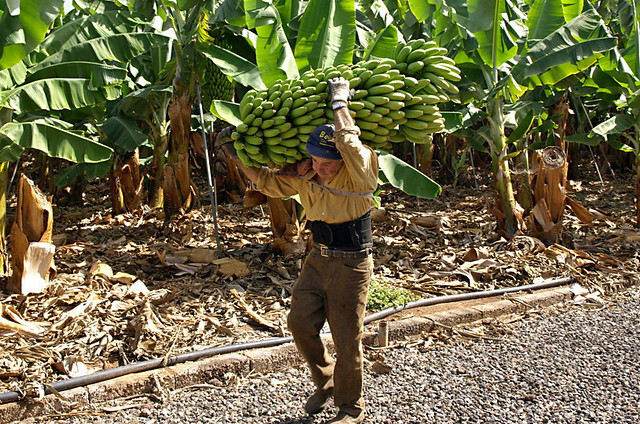 You get La Gomera on the horizon and encountering plantation workers carting huge clusters of bananas reminds that not all traditional occupations have been eroded by tourism. The Teno Massif bridges both north and south west and some routes cross microclimate after microclimate, resulting in the sort of constant changing of clothes more suited to a diva’s stage show. It includes a route which is one of the first we’ll take hiker friends on when we want to impress them. 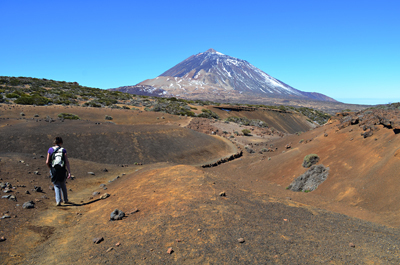 It requires effort, there are no shortcuts to standing on a narrow ridge with Mount Teide straight ahead, rugged valleys on one side and the glistening Atlantic on another. As one friend put it, “it’s almost the perfect walk”. 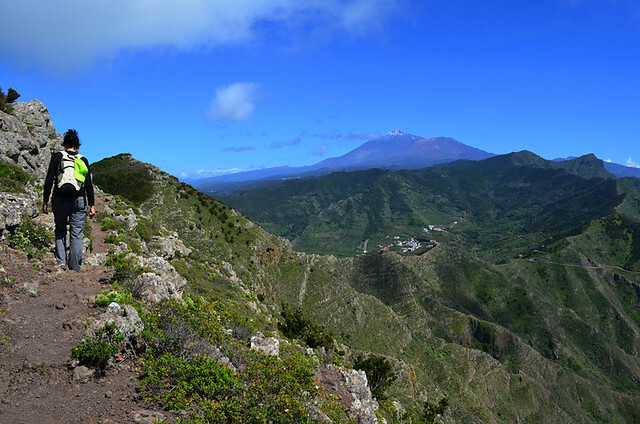 These are only a selection of scenes to be enjoyed whilst walking across the west and south west of Tenerife. 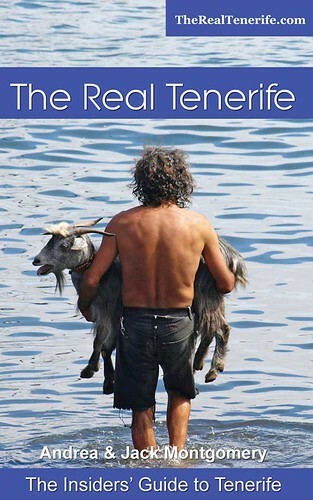 Next time we’ll look at six scenes from the Isla Baja and the north west of Tenerife. 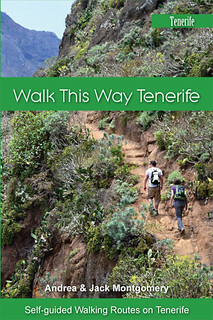 Most of the places mentioned are included in either our PDF walking routes or our Walk this Way Tenerife guidebook.